There are many alternative roads one could take to get here and I do not list every possible variant. If coming from Col des Aravis (1486m) you start in Flumet (908m). 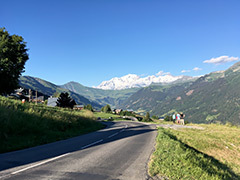 If coming over Megève (also a pass – Seuil de Megève (1107m)), you start in Frassette (957m). If coming down from (Col du) Cormet de Roselend (1969m) or possibly the gravel pass Col du Cormet d’Arêches (2106m), then it is logical to start the climb on the road from Manant (700m) below Beaufort. If you have visited the nice Col du Joly (1989m) (which has lovely views from the top) then the climb starts in Hauteluce (1104m) and it is short and easy. The best views are on south climb in the higher regions toward the Mont Blanc region. Col des Saisies/Les Saisies is a big, touristy ski resort village. The geographical pass is at 1633m (which is also situated on asphalt below on a minor road). See also Col de la Lézette (1787m) which is really the high point of this specific climb. Mont Bisanne (Signal de Bisanne) (1941m) is the highest and most interesting asphalted climb in the area. To go to Mont Bisanne from the Saisies you go down to 1575m on the south side and take a road up there where you have very good views. Some more approaches I accounted for earlier: 1098m - 15.2 km (Villard-sur-Doron); 1138m - 16.1 km (Les Perrières via Doron); 1158m - 15.9 km (Les Perrières); 1286m - 18.9 km (Queige); 1460m - 23.1 km (Ugine (south)); 1432m - 21.9 km (Ugine (east)).